At Books 4 Buddies, we are proud to have received the following recognition for our contributions to the Toledo community. "When Touré reached out to me for help, it didn't matter what it was for. As a life long friend, I would do anything for Touré. Growing up together, we had a lot of fun; and to this day, we have managed to keep in touch despite living miles apart. So the day when Touré told me about his vision for Books 4 Buddies, I was ready to embark with him on another great adventure. I quickly fell in love with the organization and everything it stands for. Literacy and education are powerful equalizes for underprivileged youths in this today's competition driven society. Moreover, it is imperative that young boys especially be encouraged to read and learn in order for them to realistically achieve their dreams. With this in mind, I devoted a lot of time volunteering with B4B during the summers and throughout the year since the program's inception in 2012. I believe the most important part of my role as a Book Ambassador is reading with the children. It is important for them to see me reading, so they can understand that reading books is an enjoyable activity that brings people together. Being involved in B4B has also been a rewarding experience for myself as well. The program has developed my leadership skills and given me the opportunity to interact with youths from as far away as Shanghai, China! I have no doubt that Books 4 Buddies will continue to grow and positively shape the lives of future generations. And I'll be prepared to contribute and grow with it because as Mrs. Goings says, 'Once an Ambassador, always and an Ambassador!'" "In the Spring of 2016, Books 4 Buddies was able to provide dozens of books to help Washington Church fill nearly 40 'little free libraries' built for the families of students at Grove Patterson Academy. Installed in their neighborhoods, these free lending libraries will benefit kids throughout the community. Books 4 Buddies' books were age-appropriate, and of interest to all sorts of kids... a real blessing! "On behalf of the Jones Leadership Academy Chess club, we can never thank the Books 4Buddies Program enough for the donation of much needed chess books for our club. The response to our call for help was answered so quickly that we could not believe it when the books arrived within weeks of ordering them. 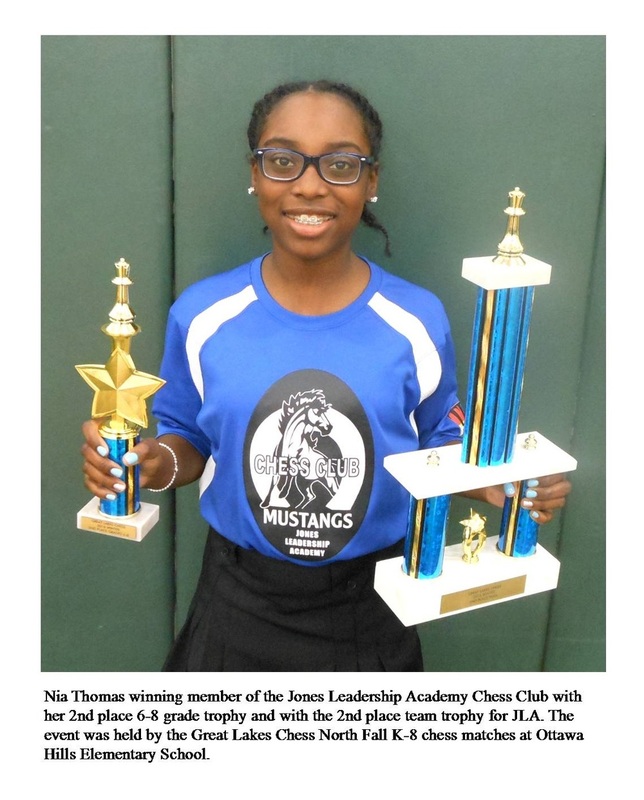 The books allowed our students to not only advance their chess knowledge, but there has been a noticeable increase in their academic grades. It is without a doubt the results of the chess books from Book4Buddies. 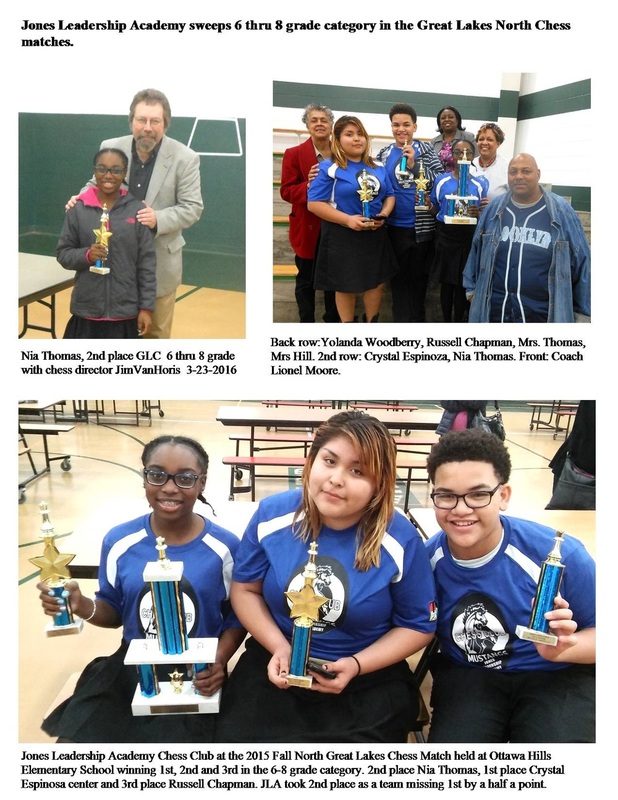 We recently competed in the Great Lakes Chess Association North series of chess matches where our 3 person chess team won 1st, 2nd and 3rd place in the 6 to 8th grade category while winning 2nd place as a team at Ottawa Hills Elementary School on Wednesday Mar. 23, 2016. The donation of books from Books4 Buddies will always have our gratitude for their support." "We will definitely like to continue to have Books 4 Buddies and the ambassadors come to our center. Our children as well as our families really benefit and are so thankful. Bringing language and literacy into their home is so important for our program. Our staff was so excited to see the community involvement with our Migrant Children and families. Yes, please do continue to provide our children with this experience." "I thoroughly enjoyed the entire experience that is B4B. Books 4 Buddies is more than your everyday non-profit organization. B4B is an experience. It is a living, breathing organism that has grown and continues to grow. That is the most exciting thing about B4B. It has reached so many lives and has already made a noticeable impact but it still has the potential to make even more of an impact. It is wonderful to see the smiling faces of the children we impact as ambassadors. To have that one on one experience is unique and something I really value. I enjoy working to promote B4B online and in the community because I believe strongly in what we can do." "Thank you so much for the donation of books. Pilgrim has several ministries that will benefit including our Jamaica Orphanage mission. Our team this December will be taking down many of the books to the home. Many of the children at the orphanage do not attend any school because it is costly. We employ a woman there who tends to the children in many ways including educating those who do not go to school. The books and workbooks will definitely help change the life of a child. Educational workbooks are priceless for they have no means of copying worksheets like we do here in the United States. Books for Buddies is not only raising awareness in our community of the illiteracy problem in young boys but also changing the lives of these boys and turning them into educated young men. Your program is a wonderful addition to our community. Keep up the good work." "Sincere thanks to you for donating the beautiful books to the children who attend the two Central City Ministry of Toledo schools, Rosary Cathedral and Queen of Apostles. As you know, we started a program last year to build our students “at home libraries.” Many of our students, perhaps even most of our students, are not encouraged to read at home, do not have books available at home. Consequently the children arrive at CCMT two years behind in their reading skills. It was decided that we could help improve this situation. Every time we have a special program or a child deserves an award they receive a book to take home that has been donated to the school. So far this year, we have been able to send home a FREE book after our “Picnic in the Parking Lot” parties and at Parent/Teacher conferences. And this was made possible by you and your Books 4 Buddies program." "The Neighborhood Health Association can’t thank you enough! WOW…what a wonderful thing to see parents reading to their children in the waiting rooms while waiting to see the pediatrician. Thank you Books4Buddies! The children’s eyes just light up when they are told they can take the books home with them." "Around the former part of my junior year, as I began to frantically worry about the upcoming treacherous college and national honor society application process, I realized that there was a gaping hole in my résumé--a surplus of volunteer hours. National Honor Society within many high schools centers on volunteering, so without any hours under your belt there is almost no chance of getting in. Also, a huge factor that comes into play when colleges decide whether to admit an applicant is their character and volunteering only illuminates qualities of good character. I would spend countless hours surfing the web and asking my fellow classmates about possible volunteer hours. Luckily, my track teammate told me of the growing organization--Books 4 Buddies-- and of his wonderful experiences as an ambassador. I decided to volunteer, specifically for this organization, because reading is one of the most important activities necessary to learn and grow and succeed. My ample volunteering opportunities presented me with a way to discuss with underprivileged youth the importance of reading books for intellectual growth. My most satisfying experience as an ambassador was simply being able to read to the young children and show them that reading is a “cool” activity to participate in. Volunteering for me is a great way to serve others without expecting anything in return. Becoming an ambassador for books 4 buddies was one of the best decisions I have made in my life thus far."